His iconic picture books have been translated into over 20 languages and spawned countless TV cartoons and films. The idea that Dr. Seuss, who is known for writing children’s books, being considered racist was a shock to me and it was a complete contrast to what you usually think when you remember his work. 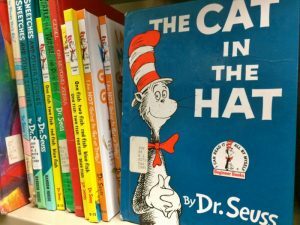 The controversy all started when a librarian, Liz Phipps, rejected to accept several Dr. Seuss books donated by first lady Melania Trump, citing that the books were racist propaganda and contained harmful stereotypes. In another incident, several famous children’s book authors, Mike Curato, Mo Willems and Lisa Yee, declined an invitation to the Literature Festival at the Dr. Seuss museum in Massachusetts claiming that the mural at the museum featured a racial stereotype of a Chinese man that they found offensive. Both viewpoints held some truth. However, I didn’t find myself wanting to join either side. Was Dr. Seuss really a racist? Or were people just exaggerating? I decided to see for myself. Doing a search of “Dr. 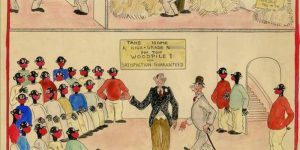 Seuss racist” brought me to many offensive caricatures of Asian, African American, and Jewish people in the form of political cartoons and artwork. It didn’t take me long to see how some people would find some of his work objectionable. One particular image that shocked me was a drawing he did from the 1929 titled, “Cross-Section of The World’s Most Prosperous Department Store,” which depicts a department store and contains a prominent display of the N-word and people in blackface. It was a big contrast to how I usually think of his work, and I am sure many other people would be surprised to see this image as well. However, seeing it, I was also not completely surprised. Famous animation studios such as Disney and Warner Bros. cartoons contain offensive imagery in their early period. These artists should not be let off the hook. The work they did at this time was horrible, but there is also a historical context to the images; this was a time where many people were ignorant. While the mural was not as offensive as some of Dr. Seuss earlier work, I understand where the librarian and the three authors were coming from and why they had objections. Disrespectful and offensively prejudiced, it is true that Dr. Seuss has a history of racist art. There is a belief that people should separate art from the artist’s life; that a person can enjoy an artist’s work without having to align themselves with the artist’s personal beliefs. In case of Dr. Seuss, however, what is a person supposed to feel when not only is the artist’s character spotty but the actual art he created is problematic? The reason why I don’t feel like Dr. Seuss should be deemed a racist all together is the fact he seemed to outgrow his prejudice. The caricature of the Asian man from the mural was from the book, And To Think That I Saw it on Mulberry Street and was actually reworked by the author himself. He created a less stereotypical version of the man because he realized how his original was offensive to people. More than likely if he was alive today, then he would have done the same thing to the image that people still find offensive. Not only did Seuss stop creating offensive artwork, but he wrote and created many books with anti-racism messages. Horton Hears a Who! celebrates and advocates equality for everyone and his book, The Sneetches is about tolerance and diversity. Many scholars also say that he regretted the political cartoons he did. 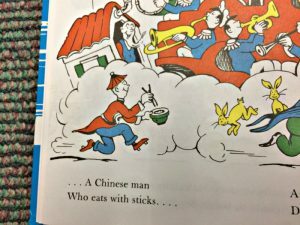 So is Dr. Seuss, a racist? Yes, he definitely was, but he became a better person. In my opinion, I would not remove the mural because the mural provides a dialogue of his work and the person he was and eventually became. I don’t think the mural or his books, in general, should be diminished. We should not pretend he was innocent and we should not forget his history of racist art. But we should also remember how he was a person with flaws to someone who became enlightened and learned from his mistakes and grew.